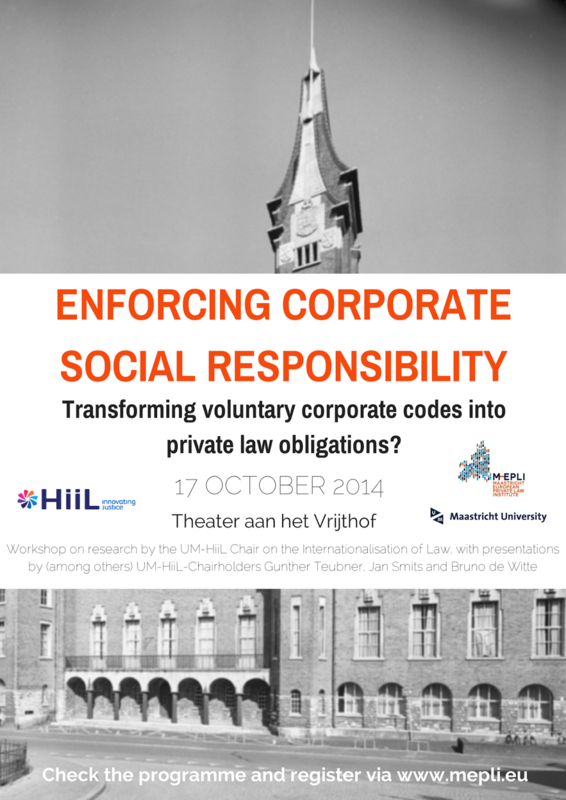 I was fortunate enough to participate On October 17 in a “Workshop on research by the UM-HiiL-Chair on the Internationalisation of Law, the theme of which was “Enforcing Corporate Social Responsibility: Transforming voluntary corporate codes into private law obligations?”, held at the Theater aan het Vrijthof, Vrijthof 47, Maastricht, Netherlands under the sponsorship of the University of Maastricht, the Hague Institute for the Internationalisation of Law, and their UM-HiiL Chair. The workshop description and program follow below. I spoke to the “Implications for the effective regulation of companies.” My remarks, “A Lex Mercatoria for Corporate Social Responsibility Codes without the State? : On the Regulatory Character of Private Corporate Codes” also follows. We have gathered here to celebrate, and consider, what I think we will be able to look back on as a great example of the robust development of the project of legalization within the logic of globalization. In her thesis, “Taking Corporate Codes Seriously: Towards Private Law Enforcement of Voluntary Corporate Social Responsibility Codes,” Anna Beckers looks out across more than a century and across two germinal events—one a fire in a sweat shop in New York and the other a fire in a sweat shop in Bangladesh—to theorize, and quite persuasively, the continuity of a project of the legalization of the social and economic sphere that is undiminished by time. Though the context is quite different, the project remains the same—to embed behavior control within a network of mandatory proscriptions attached in some authoritative way to the state. It is the difference in context that poses the challenge—not the ultimate object. The political context is globalization and its re-situating of the state (or perhaps at this moment in time all but the most powerful of them) as perhaps not the sole occupant of the apex of political and social power in the world. The social context is rule systems being developed by private actors, primarily corporations and NGOs, and public actors, most recently the Organization for Economic Cooperation and Development and the apparatus of the UN Human Rights Council. The economic context is the business enterprise unconstrained by borders, political or otherwise. Corporate social responsibility bound up in corporate codes of behavior and related private governance standards systems thus serve as a key site for the evolution of legalization and legitimacy in governance, from its 20th century formalist rigidity into something of a bridge between the political and social sphere. And for this purpose, the state, like the corporation before it, is reduced to a nexus of connections within the structures of governance. These insights apply, I believe, with equal force to the constitution of a law for corporate codes. The move to reconstitute law within a legalization project threatens the underlying foundations of the current law-state and this can threaten the authority of law and of the state. Paradoxically, perhaps, the project of legalization evidences how a love of ancient custom, in this case the customs and patterns of the post-Westphalian law-state, remains, while power shifts to those, enterprises included, that have brought about a revolution in the state, and in the meaning of legalization in a new world order that has yet to be revealed. The remainder of these remarks are meant to briefly sketch out what I see as the danger—for state and business enterprise—that flows out of the fundamental ideological premises that appear to make legalization within the state necessary and inevitable, when it may be neither but for the blinders of the ideology that appears to make them so. I offer this as an exercise in mining under the fairly thick walls of the ideology of law and state, not to undermine this ideology but to offer a view of the world from beyond its walls. And so, when I look across the century from the Triangle Shirtwaist fire to the Rana Plaza fire of 2013, I might see legalization in a substantially different light, one in which the state may play a substantially reduced role and from which it might profit by its absence, one in which a legalization of the social and economic sphere may be indeed proceeding, but not in an unbroken line nor in the shadow of the state. I start by positing two quite distinct views of the relationship of the state and law, both of which were formed in the fires of the Anglo-European revolutionary period from 1640 through 1917. The embrace of any one of these views tends to fundamentally shape the context in which theorizing codes can take place. I then consider how shifting from the dominant view of state-law fusion to those that posit the autonomy of law might allow for the possibility of alternative approaches. To that end I consider several of the key premises underlying the code legalization project. 1. Ideologies of the law-state. The struggles of the post Westphalian period to theorize and implement a new model of state organization profoundly affected the framework within which analysis of governance became possible. Though a large variety of state theory has emerged since 1640, virtually all of them share the same foundational characteristics. These foundations are, in the West at least, two strains of Enlightenment era ideologies that produced sometimes profoundly distinct notions of the value of government, the necessity of government to law and the relationship of the state to the individual. Both are grounded in the ancient concept, now understood as infinitely malleable, of popular consent. On the one hand, consent can be understood as the expression of the popular will, made manifest through government and expressed in law enacted through this apparatus of state. In this construct law is impossible in the absence of government and government provides the incarnation of the popular will which is itself the manifestation of the best interests of the individuals now come together within a political community. Government is a source of protection, and obedience to government is a first principle of active engagement with the state. The protection of that manifestation of the general will is the highest order of systemic protection―process, legality, and a commitment to a basic set of substantive rights form the core of this approach to government and law. This is an approach that found its most congenial home in continental Europe and Latin America. A variation of this approach underlies Marxist Leninist political theory and state organization. On the other hand, consent can be understood as a means of organizing a community of like interests for the protection of specific values (in the Anglo-American world, of property) and the operationalization of popular custom and traditions. In this construct, government is consequential, something that is necessary to ensure protection but is not otherwise invested with any inherent power or character. As a site for the assertion of power against individual interest it is viewed with suspicion and framed in a way that ensures the smallest interference with individual privilege (understood within the structures of custom and tradition to which the community adheres). Consent and adherence to the government is disciplined by ensuring that all are equal before the law (that in many cases remains a work in progress of course) and that the law is firmly anchored in custom as the lived set of consensual practices of the community. Government is thus both a source of protection and the space within which joint efforts for improvement can be undertaken. Government is understood as limited in the scope of its power and is itself constrained by law, including the higher law of the state (the subject of so-called natural, religious or constitutional law). The organs of government specified therefor may make law but law is not attached to government nor entirely derived from it. This is an approach most notable in pre modern England and its colonies, and a variation of this form prevails in the United States, though for how much longer is hard to say. There is a third way of theorizing consent and the construction of the political order. That path suggests not merely the separation of law from the apparatus of state, but also the passive role of the state in the construction of law, that is left to a democratic process beyond the state organs itself. It is founded on the notion that legal instrumentalism is itself anti democratic and that it is the functional aggregation of the facts of life that provide the basis for law—the ancient customs and liberties of a people now transposed to a post modern age. There are at least two well-known variations, of course. The older one, which provided much grist for Carl Schmitt and his kind, posits custom and social norms without limit, but as a corollary suggests that communal borders may be drawn in any way and to keep anyone out. The other, also in some sense ancient, posits a set of law above laws, either as natural or theological law, which serve as meta-taboos. In these frameworks the legislature acquires a vestigial role and the force of the state is centered on administration. The project of legalization, then, acquires substantially different meaning, depending on which of these fundamental premises of the law-state is invoked. The 20th century was the great period of the instrumental law-state as the center of primal authority over a political sphere that was deemed dominant over the social and economic (and to some extent the religious) spheres. The 21st century may see exposed a revolution in ideology, now masked by the power of old patterns, that makes a legal imprimatur less relevant for stability or authenticity of governance. The unmasking of the new may well come when the project of expanding the meaning, content and sources of law (the project of legalization) becomes so broad that it itself becomes meaningless and the new categories that lie beneath it become better exposed. What those are we have only a clue at the moment. But it is clear that the new world order involves the re-fracture of power and a more polymorphous and heterodox system of hopefully coherent systems of rules that bind, sometimes like law and sometimes not. 2. Consequences for theorizing corporate code legalization. The legalization of corporate codes project provides some useful clues. Let me highlight just a few. 1. The first, of course involves the labeling project of legalization. Legalization, and its promise of stability and legitimacy follow from the judgment inherent in the descriptor—voluntary—usually attached to corporate codes. This applies whether the codes are 3rd party public or private efforts from the OECD, U.N. or Amnesty International, or whether they are the idiosyncratic product of an enterprise respecting its supply chain. To label such codes as voluntary is possible only within a regime that posits the model of law within the state as the highest ideal of governance and the truest form of legitimate expression of power—public, democratic and bound by a domestic legal order that is a world onto itself (though in communion with others of its kind). It suggests codes as subordinate, contingent and transitory and thus deploys the premises of the underlying ideology to avoid contention. Codes have the character they do precisely because that is the place they are assigned by the natural logic of the ideological system of the law state which itself remains unquestioned. Thus “genuine legal obligations” may arise only within the tight space of domestic legal orders, and governance that falls “beyond the law” do not because they are sourced beyond the state. But this can be true only under conditions of the classical law-state where the identity of law and the state is assumed without question. But where law may exist autonomously of the state might codes not also be conceived as genuine legal obligations, though not that of the state, and not perhaps of a sort for which remedies might be sought through the state? 2. The second arises from the character of corporations and their relation to the apparatus of government and its legal structures. Under the premises of the classical law-state, and especially in continental Europe, it is natural to speak of the corporation as a creature of law, certainly as to its personality and its relation to the apparatus of state. But that notion rests on the more profound idea that the sole authentic and primal incarnation of communal will must be the state, and that all other aggregations of communal will—from corporations to social organizations—necessarily derive their license to operate from the state. In its extreme form, in European Marxist Leninist states, the very idea of the corporate form apart from the state is itself inconceivable—as is the case in contemporary Cuba. This construction includes a critical wrinkle—the emphasis of the fundamental aggregation of corporations as one focused on capital, rather than on the aggregation of social forces. This is the classic formulation that brings together the fundamental tenets of both classical capitalist and Marxist obsessions with capital and the consequential idea that corporations are at heart “merely an accumulation of capital.” While these ideas serve the premises of the classical law state, they might become less compelling when the premises of the law-state are removed. The reason, of course, is that the classical theory of corporations assume the subordination of the social sphere to a political sphere occupied in its entirety by the apparatus of government. Once one presumes an organization based on capital and dependent for legitimacy on a derogation of state power, everything else follows. But that focus on political subordination and the primacy of capital can both distort and constrain analysis. It fails to consider both the autonomy of the social role of enterprises free of the ideology of capital (in both its capitalist and Marxist senses) and fails to understand the social costs of the subsidization of this construct, including the construction and maintenance of corporate codes. Perhaps Catholic social thought has hinted at a distinct approach, but that too is only in its nascent stages of development. 3. The third arises from the consequences, thought to be natural and inevitable, that because corporate codes are regulatory—because they ape law—they assume an incursion into the political sphere and thus necessarily must be absorbed in some way by the state to ensure that these regulatory forays become law. Yet here, shifting fundamental premises of law-state relations, suggests that the problem may well lie in trying to transform the societal dimension of governance into a legal dimension (that is into a state of transition to law) by using the notion of regulatory intent or function as a bridge. One moves from interlinking to intermeshing to amalgamation and transformation as an inevitable process that is triggered by the determination of regulatory intent. Outside of the classical parameters of the orthodox law-state, the underlying premises of this approach are dangerous and erroneous. It suggests that regulation is necessarily legal and thus within the domain of the state. As a consequence, where such regulation remains “private”, that is in the social or economic spheres, it is necessarily incomplete and transitory. But that can be true only under orthodox law-state theory. It does not follow from other conceptions of the relationship of law to the state. It is dangerous because the premise is itself grounded on the notion of the right of the state to impose itself without limit in the social sphere. Yet this power is itself belied by core notions of western constitutional ideology that are grounded in fundamental constraints on state power. And it is also contrary to notions of respect for belief communities and their rights of self-governance, ideals not limited to religious communities alone. Thus governance contracts of the sort that include many corporate codes may point to new forms of rights and duties but perhaps ones falling outside the state apparatus as readily as they might be conceived as inevitably tending toward “the legal.” The premise is not inevitable that societal governance = regulatory legality for which the intervention of the state is required or preferred. Carl Schmitt’s articulation of the claustrophobic world of parliamentary democracy must give way to the realities of power shifting around the informal legislatures of the enterprise organismus and its opponents, the individual disembodied, aggregated and reconstituted as NGOs in social space, but also interlinked with the political spaces where their effects can be felt. 4. The fourth follows from the implications of social sphere legislation but in two respects. Within the orthodox premises undergirding the law-state, especially within Europe, it is necessary and important to reject the notion of any equivalence between societal and legal-political constitution. To do otherwise would subvert the hierarchy of legitimacy at the core of the law-state system. The boundaries between societal and political constitutionalism remain important for the integrity of either. Yet the project of legalization might well subvert this fundamental distinction even as it seeks to preserve it. Where corporate codes are understood as species of legislative privatization if focused on generalized societal interests, then they are recharacterized as moving into the public sphere with the consequence that they can only have authoritative effect if reconstituted as legal and legislative. Might this be an inversion of the old Marxist dictum that law is politics is economics to something like economics is politics is law? Yet to bring corporate codes “back home” into the state through the mediating techniques of legalization might undo the very foundation of the law state system in two ways. First, it stretches the meaning of law beyond the parameters within which it remains a coherent subject of politics in the law-state system. What corporations produce is not law, can never be law, and may well offend classically understood notions of law. What corporations produce may be legalized, but to call it law is to suggest that any act of power can, through the expedient of legalization, affect the appearance and usurp the authenticity of law—which within orthodox theory must be a product of the state apparatus and sourced within its normative framework. Second, it might make it possible to destabilize the core foundation of the system by substituting powerful functionally differentiated actors for the popular sovereign as the source of law. Worse, it would undertake this subversion through the techniques of judicialization of the legalization process—by stretching and contorting the interpretive processes of courts to embed corporate codes without legislative action. And where legislative action may be needed to operationalize, it might be reduced merely to the expedient of permitting the courts to engage in this activity. These are problems not merely of definition but of normative effect. It presents the law-state with a conundrum—it must legalize to preserve its coherence as a regulatory system, but it may lose its coherence and legitimacy as a regulatory system if it engages in this sort of legalization. The answer may require the abandonment if the orthodox law state in the face of globalization—it is the state that will change in order to authoritatively embed the corporation within the political sphere other than through its administrative regulatory apparatus (the regulatory agencies through which such interactions have been traditionally mediated in the modern administrative state). 5. Last, just as law can be understood as political governance with social and economic objectives (even if the latter is merely to structure markets), so corporate codes might be understood as economic governance with social and political objectives structured in legal form. The power of both is enhanced through formal and informal interlinkages that create webs of polycentric and partial governance that might be felt distinctly across the supply chain and beyond the territory of any particular place. That may well be the single most important consequence of globalization—not chaos, but anarchy, order without a center, and an ordering of rules in three-dimensional space. The project of embedding through legalization presents substantial and perhaps necessary opportunities which, if done well, might extend the reach of the law-state while preserving its normative forms and legitimacy. But doing it well might require a bit of self control under conditions of social differentiation where embedding can only be as incomplete as the regulatory reach of the corporate code enacting enterprise or the reach of the international “soft law” norms they might be made to embrace, first as norm, and then in a mandatory fashion through legalization. Indeed, neither the power to regulate nor the acts producing legalization can be understood, standing alone, as sufficient to support systemicity among polycentric social and political subsystems that themselves are fractured and interlinked in dynamic and partial ways. Legalization does not speak to the coherence of the corporate codes of Walmart, Nike, Zara and Philips creating a connection with the legalization in the European Union, the United States, China and the like, unless differentiation is understood solely as functional and not normative. Legalization thus carries with it a harmonizing element that may be as mandatory as the resulting legal liability of enterprises within states. But that leaves the larger issue of differentiation. Legalization, under conditions of the logic of the law-state, can reach equilibrium only when all of these subsystems are knit together—one way or another. But that process also threatens the law-state by suggesting that it no longer sits at the apex of power and that democratic theory ends at national borders, which remain quite open to projections of legalized power from abroad. I have said enough, I think, for one sitting. If corporate codes are regulatory and socially embedded, then they function politically, and to that extent, to the extent of the political function of societal embedding, then legalization is necessary to embed codes into the state, and so embedded, to stabilize and authenticate them—as law, as bridges between societal and economic spheres, as structural coupling, as a means of imposing coherence on multi-governance systems, etc. If corporate codes are understood as political in this fashion they must be expressed in the only way open for such expression, by a legality that itself is an expression of and permission from state power. This is the necessary logic one can extract from the normative grundnorms of the law-state system that posits the state at the center of law. But that also requires a modification of state legality that is itself problematic because it recognizes a source of law generating power beyond its own apparatus (the government) and without popular constraint, and only partially within its control. The necessity of legalization presents its own dangers. And it might well be that in the process Aristotle’s suggestion that the forms of legalization will long outlive the revolution that such actions usher in may be a consequence that only our children will live long enough to appreciate. Originally posted by Larry Catá Backer on his blog.